The Sagittarius woman is restless and admires bold speech. She's piqued by adventure and bored by people who are trapped in negativity. Sagittarius in love needs lots of freedom to move. She's not fussy, and won't likely spend hours getting ready to go out. Her no-frills style allows her natural vitality to shine through. She favors the authentic to the synthetic and takes pride in staying true to herself no matter what. A great first date locale is a place with mystery or the chance to get physical. The Sagittarius woman is attracted to someone who has brilliant insights and who activates her own mind. As a mutable sign, she loves change. Bright eyes and 1,000-watt smile: that's the Sagittarius woman. She's friendly to everyone and has a social grace that makes for light first encounters. She's alert and always looking to make new friends and learn from everyone she meets. 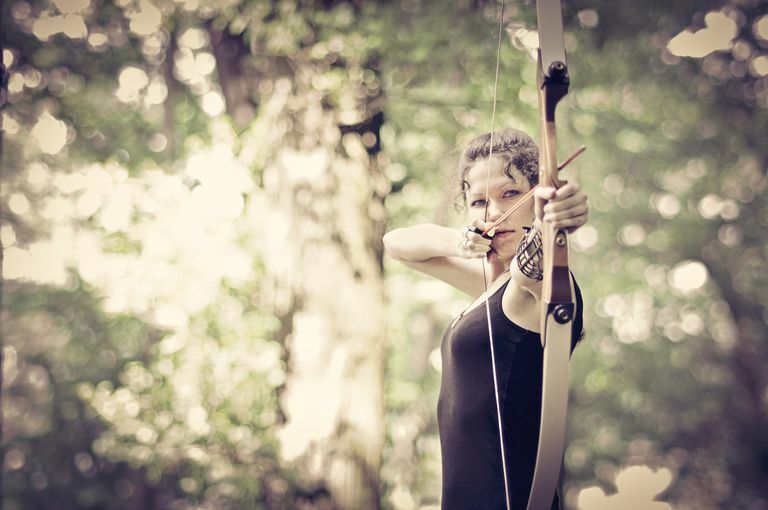 Sagittarius the Archer often moves in and out of hobby or interest groups, happy to stay socially unattached. If you meet her in such a scenario, you'll catch her eye by being as present-in-the-moment as possible. If you attempt to absorb her in conversation and take her out of the moment, she'll smile and gravitate toward others. A stellar way to attract a Sagittarius is to be a stimulating, but light, conversationalist. She loves to spend time with people who are curious about the world. Sagittarius is a fire sign and wants to be inspired first and foremost. If you want to engage her, tell her about your passions and make her laugh. The Sagittarius woman is blunt, which can be freeing since truth-telling is liberating. Let this inspire you to say what's on your mind and in your heart. She might not agree with you, but she'll respect your candor since her nature is to be open about her opinions. It's said that there are two kinds of Sagittarians—the super athlete and the intellectual-artist. Impress your Archer by knowing which arena she moves in and being ready to hit the ground running (maybe literally). She is an explorer of worlds, and/or an athlete always competing against her own personal best. High-energy Sagittarians like to be physical and keep moving, whether that means riding a bike or learning something new. Be her companion in adventure and the love will grow. She's a friend to many, so you'll have to curb your jealousy and learn to be the Sun to her Moon. She's her own sunny bright light and doesn't thrive in captivity. Let her be free to grow because it suits her nature. There's an innocence about the Sagittarius woman that helps her keep believing in a bright future. Win her heart by supporting her when she takes risks. Cheer her on when she succeeds, and be there for support when she meets harsh realities. The Sagittarius woman is one of the most sexually uninhibited signs, but all fires need that initial spark. She's a physical being, and often has energy to spare. Some Sagittarians are polyamorous, which means they are inclined to love more than one partner at a time. Sagittarians love to sample the smorgasbord of life. The emotionally light approach, the passion, and the physical resources all make for a strong libido that is happy to spread the love around. As always, look at the totality of the person, and their astrological make-up, before jumping to conclusions about a Sagittarius woman. Meeting her with an open mind and open heart is always a good start.